There is little question that the descendants of the new European immigrant groups from Southern, Central, and Eastern Europe have done very well in the United States, reaching levels of achievement far above blacks. Yet the new Europeans began to migrate to the United States in 1880, a time when blacks were no longer slaves. Why have the new immigrants fared better than the blacks? This volume focuses on the historical origins of the current differences between the groups. 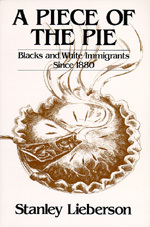 Professor Lieberson scoured early U. S. censuses and used a variety of offbeat information sources to develop data that would throw light on this question, as well as provide new information on occupations at the turn of the century, finding remarkable parallels between the black position in the urban South and the urban North. He examines and compares progress in education and in politics between the new Europeans and the blacks. What were the effects of segregation? Why did labor unions discriminate more severely against blacks than against the new immigrant groups? This book will generate a fresh interpretation of the origins of black-new European differences, one which explains why other nonwhite groups, such as the Chinese and Japanese, have done relatively well. Stanley Lieberson, Professor of Sociology, University of Arizona, is one of the leading scholars in the area of race and ethnic relations and has published extensively in the field.